If you actually look at most modern gondolas out there today, you’ll find that most open top cars from the last 30 years or so actually don’t have any interior paint or coating, but instead the interior of the cars are raw, unpainted steel (other than perhaps some overspray from the painting of the exterior of the car). Of course, with some exceptions, most model cars do not reflect this and instead of masking and painting the interior a rust or brown colour (which would really still need to be painted/weathered for a proper rusty steel look anyway) the whole car, interior and exterior, is painted the body colour. 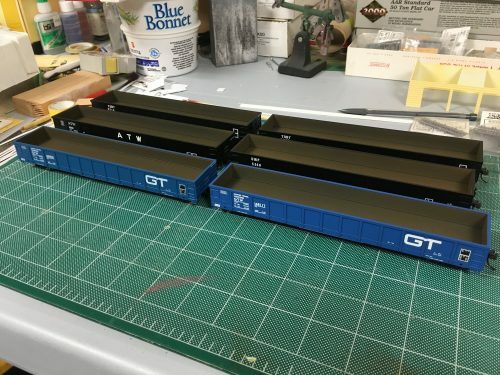 I was having a bit of a painting and weathering weekend this weekend, and got out this sextet of Atlas Trainman SIECO gondolas to paint the interiors “rust”. To get a good steel colour, I start by giving the inside of the cars a good base coat of Gun Metal. This gives a nice dark metallic colour as a base to work on. Then the rust colouring is added with several very thin coats of Rail Brown, Roof Brown and Rust. These brown/rust coats should be very light and thin, not going for solid coverage and allowing the lower colours to show through. The layers of colours and natural variation created by the light, uneven coats of brown/rust provide a nice rusty steel look. I may complete the weathering with additional application of rust-coloured powders and some bits of debris from former loads, but the basic painting of the interior to change it from the main body colour (bright blue for the two GTW cars) to something that looks like unpainted steel really gets the cars popping with minimal effort. CN 136559 is a 52’6″ inside length gondola that was built in 1972 by Canadian National’s Point St. Charles shops in Montreal. An overall pretty standard mill gondola, it features drop ends and a wood floor. The design and rib spacing is quite similar to other cars built for CN, CP, British Columbia Railway and Ontario Northland by National Steel Car and Hawker-Siddeley in the late 1960s to early 1970s. At Hawk Junction July 19, 2017, loaded with steel pipe from Essar Steel. For this installment of Freight Car Friday we turn the clock way back to May 6, 1957 to look at one of the Algoma Central’s 48’6″ drop-end mill gondolas in its original 1947 as-delivered paint and lettering. The lighting is a little dark and the image is of course in Black and White, so it doesn’t convey colour information, but this early spartan scheme (dressed up with the bear logo towards the right-hand end of the car side) features a black car body with white lettering – except the rings encircling the bear logo are in red. This paint scheme was typical of all AC steel gondolas from the late 1940s and was also applied to the home-built 39′ and 40′ gondolas in the 4601-4804 series. I had some requests for some more details on the dimensions and parts used in the scratch build of these two gondolas, so I’ve scanned my rough sketches for the post spacings and overall dimensions, and will attempt to provide some further details of specific measurements and strip sizes below. I posted a scan of my scale drawing that I used as my official guide in my previous post, here are the rough sketches with a few more spacing dimensions jotted down. AC 4804-4850 rib spacing sketch, not to scale. For boom cars 10587 (ex 4601-4803) or 10588 (ex 4804-4850) the angled cut out reduces the end height by 2’6″ and runs in 7’9″ from the end. Top chord along the top edge is .010x.080″ strip. For the drop side reinforcement, I cut the pieces from .040’x.060′ strip (.060′ in the vertical direction). I started the drop 6′ in from the end on both cars. The horizontal drop portion is 10’6″ on the 4601-4803 cars or 13’6″ on the 4804-4850 cars, centred. The bottom edge of the fishbelly is 1’6″ below the edge of the side sheet. The prototype cars actually appear to have ribs that are a Z angle, which isn’t too hard to custom fabricate (I’ve done it before), except for the rounded off bottom bit. I ended up just making them a little more solid on this pair of cars, using plain .040x.040′ square strip on a .010x.060′ flange piece. The square stock is not centred on the flange, but aligned to one edge. Note when installing the ribs that the flange edge faces away from the centre of the car. (i.e. the “open” end of the Z would face the centreline of the car. The height of the rib pieces then is of course cut to length – 5’6″ near the car ends, 6’6″ in the centre and cut to size when placed over the angled part of the drop. See above diagrams for spacing. Ends are .020″ styrene sheet again like the sides, and 9 scale feet wide. The corners are trimmed up with .010x.080″ strip. Rivet decals will be applied later to the corner strips and at places along the bottom edge of the side. The end bracing is .010x.060″ strip applied flat to the end sheet, and a .010x.030″ strip applied on edge on top of that to form the distinctive T section stiffening ribs. 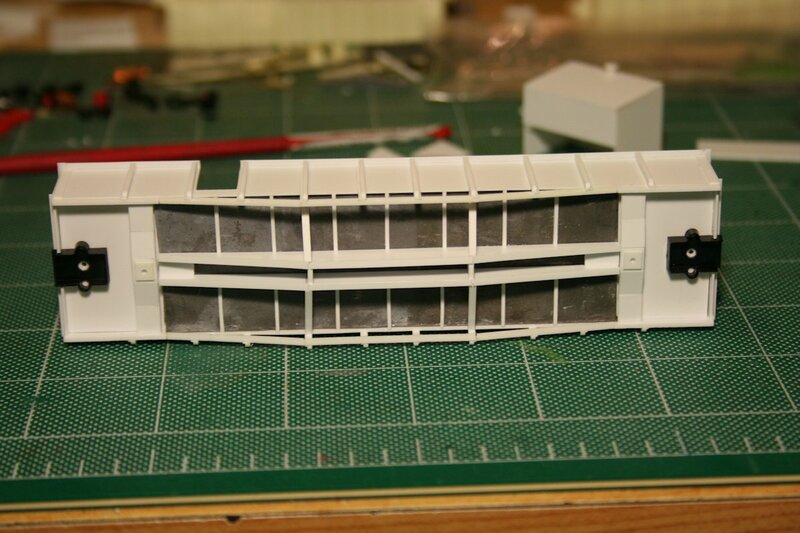 The styrene floor is also .020 sheet, cut to fit within the assembled body sides and ends. I used .080 spacer strips to recess it from the bottom edge, and I’m planning to apply a wood floor with 1x? strip after the body is painted. I used a piece of lead sheet for the weight (we had some old leftover flashing at the club – I’m not sure how readily available the lead sheet is still these days but there must be somewhere to find it) and then built up the underframe on top of that. The centre sills are .040 sheet and should roughly match the profile of the sides. The rest is all cut to fit to give an impression of the framework. Lots more to be done yet, but I think that covers the current build progress so far. Hope this is of interest or help to those curious. This is an interesting build so far, and it’s been fun to have some questions and feedback. 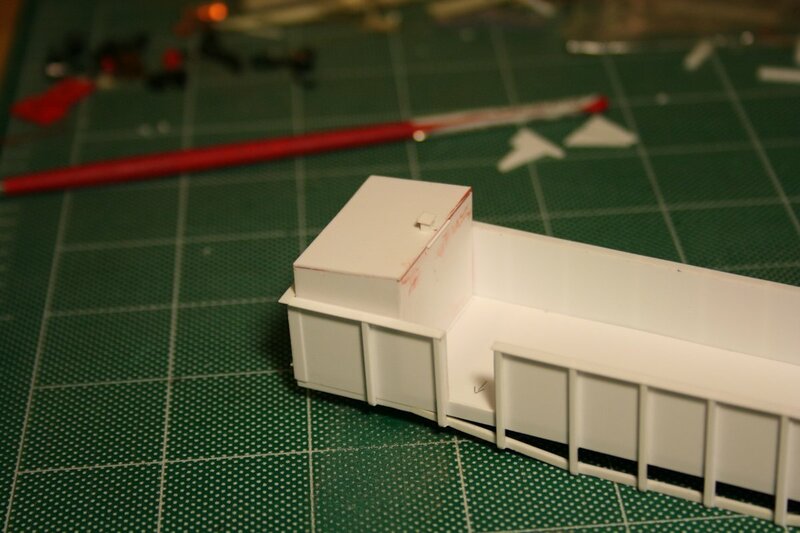 My scratchbuilt model of bucket car AC 10591 has continued to make some good forward progress this weekend. Both this car and boom car 10588 now have a styrene floor, and basic bolsters and a piece of lead sheet glued in for weight, and this evening I made some additional progress on a basic interpretation of and underframe for 10591. The second car is yet to be done, but will be similar. 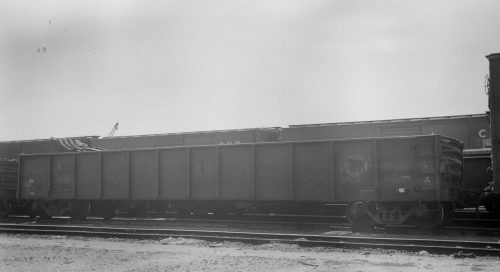 The cars were rebuilt from flatcars, so in addition to the interesting fish-belly side reinforcements, the cars have a heavy fish-belly centre sill underframe as well. I just have a few more pieces of bracing to fabricate, and then adding brake detail to the underframe. Also on one end of the 10591 is this large boxy structure. I’m not entirely sure of its purpose but suspect it to be an oil tank of some sorts. Most of the photos I have of the car are all from the end with the box, making visual inspection of the inside face of it difficult. What can be seen from any angle, however, is a large vent on top, and what appears to be a lifting ring in the middle of the top surface (possibly attached to an access or filling hatch?). 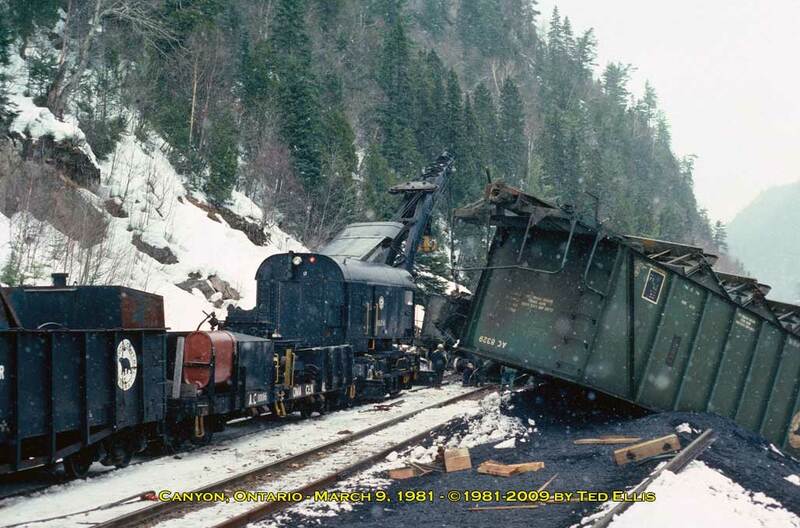 This 1981 wreck photo from Ted Ellis shows the railway’s wreck crane in action, with this bucket car included in the train, and provides a partial view of the inside face of the box. From what is visible here, the face appears mainly plain, with no doors (so it’s does not appear to be a storage cabinet), although a short drip strip across the middle third of the top edge is interesting. Perhaps there is a drain valve or some sort of access hatch to such at the bottom? I’m hoping to find some ex-ACR guy that might remember this car and might be able to confirm those details, but in the meantime I’ve progressed with fabricating the box structure itself and the top vent. I’ll continue on with other details for now, but if I don’t find any more information I’ll just have to go with my best guess for the details to apply.